Widely known as a performance artist, Faith Wilding was a key figure in the formation of the first Feminist Art Program in Fresno, CA in 1970 and at California Institute of the Arts in 1971. She was a major contributor to the now historical, month-long collaborative feminist installation Womanhouse, sited in an abandoned mansion in Los Angeles in 1972, where she performed her highly celebrated work Waiting. The first retrospective exhibition of this influential feminist artist, Fearful Symmetries features a selection of works from Wilding’s studio practice spanning the past forty years, highlighting a range of works on paper – drawings, watercolors, collage and paintings – exhibited together here for the first time. Taking up key, allegorical imagery in Wilding’s work, the exhibition focuses on themes of “becoming,” both the transformative event itself and the threshold to transfiguration. This state of in-between-ness is articulated through imagery of leaves, the chrysalis, hybrid beings, and liminal circumstances themselves, like “waiting”, the subject of Wilding’s two prominent performances Waiting and Wait-With. In honor of this landmark survey, Faith Wilding created a stunning, limited edition print for the Armory. 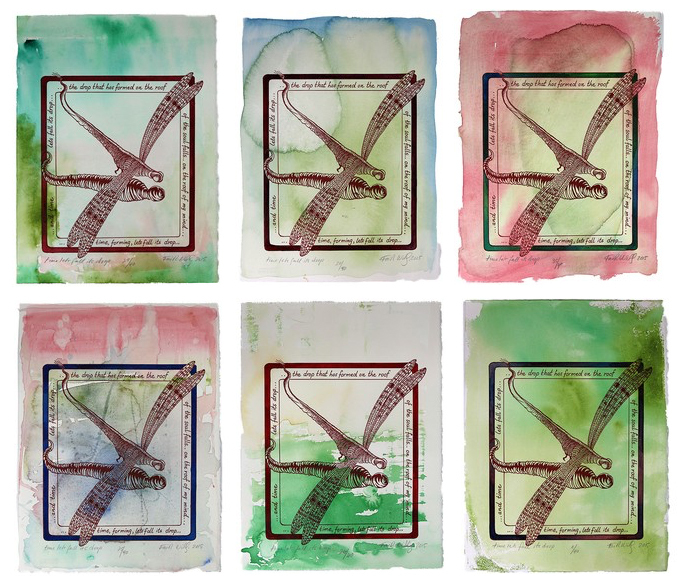 Created in the Armory's Letterpress Studio on a Vandercook press, each piece has a watercolor wash and border hand-painted by the artist, making each print unique. "...and time lets fall its drop...the drop that has formed on the roof of the soul falls...on the roof of my mind...time, forming, lets fall its drop..."
This edition of 40 is signed, titled, and numbered by the artist. It was printed by Armory Letterpress Studio Director Denise El-Hoss, with additional production assistance provided by Karen Kitchel and Lindsay Preston Zappas. Each print is $175 (plus CA sales tax where applicable). Domestic shipping is $15. All proceeds directly support Armory exhibitions. Faith Wilding: Fearful Symmetries is a traveling exhibition organized by Threewalls, Chicago. Initiating curators for the exhibition are Shannon Stratton and Abigail Satinsky. The exhibition and tour are made possible in part by: The Irving Harris Foundation, The Foundation for Contemporary Arts, The Andy Warhol Foundation for the Visual Arts, Other People’s Pixels, and Threewalls benefactors, Lisa Key and Kevin Lint. Support for the presentation at Armory Center for the Arts comes from the Pasadena Art Alliance and Loudhailer Gallery, Los Angeles.